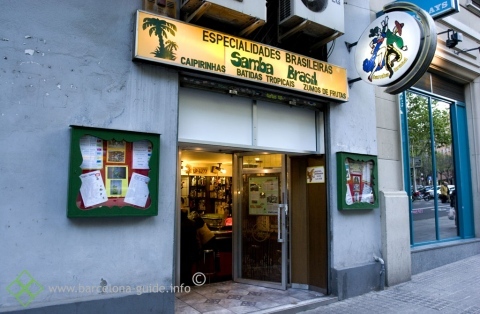 Samba Brasil offers a little part of Brazil in Barcelona. At first the décor seems quite utilitarian, especially with the lino floor and rather functional formica topped stools, tables and chairs. But it's the atmosphere of the patrons that really makes the feel of this place when it gets lively, especially at weekends. Your intrepid reviewer first visited Samba Brasil to watch that fateful World Cup semi-final football match against Germany in 2014. Tears were shed before halftime that day, but the indomitable spirit and cheerful laughter of the Brazilians shone through even as the 7-1 thrashing was inevitable, with a tongue-in-cheek chant of "¡Ocho no! ¡Ocho no!" As an Englishman I could sympathise even then, not knowing that my own county's football denudement would come but two years later at the hands of the mighty Iceland, with their 'thunderclap', in Euro 2016. As you might guess, Samba Brasil specialises in mojitos and fruity caipirinhas of all flavours, plus a large selection of gin based cocktails. 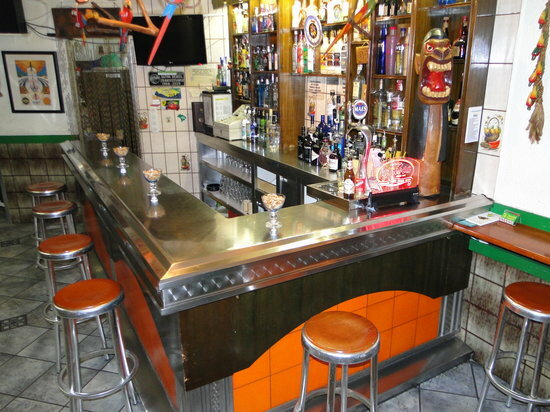 It's a small, cozy bar, so best for couples or small groups that want to experience a taste of Brazil near the Sagrada Familia.